The snow in the Grand Massif in March 2014 was excellent so we made the crossing via Tete de Saix to Flaine. We had not skied the Cascade ski run to Sixt Fer a Cheval for many years, as it is generally only open when there is sufficent snow depth and usually closes by mid-March. We did the run on 10 March and it remained open for the remainder of that week. Its such a pretty ski run, with spectacular views. It does require poling in several spots on the 14km run down to Sixt Fer a Cheval and the narrow zig-zag section at the end of the piste as it drops into Sixt Fer a Cheval often catches out a few skiers, especially if going to fast. The weather was perfect with blue sky conditions and just a slight wind chill and the piste was excellent with good quality snow right down to Sixt (completed the run by 11 am). 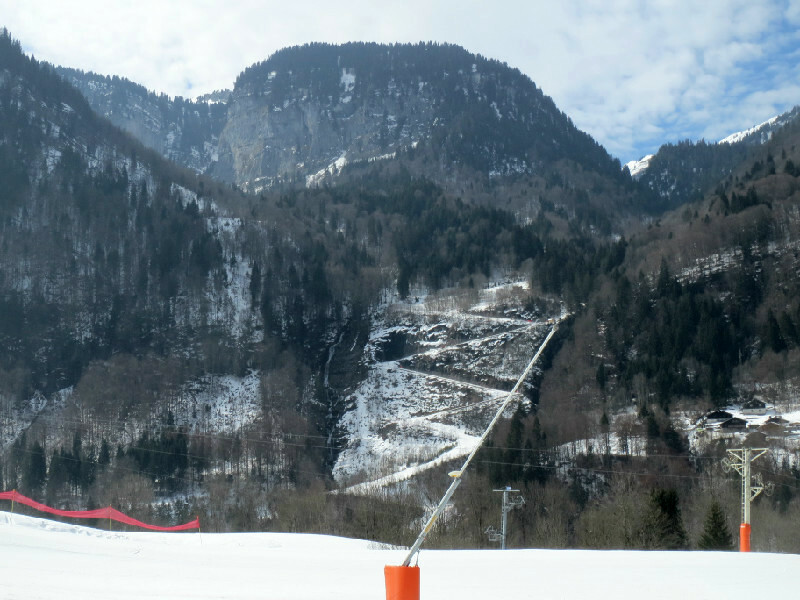 Below are two photos showing the spectacular views at the top of the Cascade piste, with marker 60 showing and a sign stating entry to the Reserve naturelle Sixt-Passy. The following two photos show the lower section of the Casacde piste which is surrounded by forests on the final stages descending into Sixt Fer a Cheval, with marker 23 and a view back up the piste showing the final zig-zag piste. At the bottom of the run is a small restaurant that serves snacks and drinks where one can wait for the free ski-bus that takes skiers back to Samoens and Morillon to continue skiing the inter-linked villages. Given the wonderful weather we had taken a picnic to enjoy a bit further up in Sixt Fer a Cheval, the photo shows one of the nearby hotels and views along the valley with the backdrop of the towering mountains. "A lovely week in Les Carroz". We’ve stayed in the village in other MGM apartments and the location of Mike and Catherine’s is superb – lovely and quiet, great views. Very well equipped, we lunched out every day and ate in at night relaxing in the warm. We were fortunate to arrive when there was plenty of snow and had mainly blue skies – all of the lifts and ski-runs were open and we particularly enjoyed our favourite, La Foriestiere back down to the village. We’ll definitely be back again.